The Cobra Lily, Darlingtonia californica, is native to southwestern Oregon and northern California. This carnivorous plant lures it's insect prey with a sweet nectar which is inside the leaf opening under it's hood. Once inside, the insect becomes confused by the many transparent areas of the upper leaf surfaces, which appear to be exits. As the insect checks these false exits searching for an escape route, it is led down the tube structure and is unable to return to the top of the plant because of the slippery smooth surface of the inner tube and the sharp, downward pointing hairs which effectively block any chance of escape. Eventually, the insects will fall into a pool of liquid digestive enzyme in the base of the leaf where they are absorbed as food for the plant. High humidity is not nearly as important for these plants as it is for certain other carnivorous plants, but a certain amount of humidity should be maintained. Although Cobra Lilies can withstand temperatures as low as freezing or as high as 100 degrees, the optimum growing temperature range is between 70 and 80 degrees F., with night temperatures being about 20 degrees cooler. It is very important to keep the root system cool. Watering is by far the most important aspect of keeping your Cobra Lily healthy. It's natural habitat is in boggy areas, near mountain streams where it stays relatively cool and constantly has cool water running over the root system. Duplicating this natural environment as closely as possible is extremely important to it's cultivation as a house plant. This can be best accomplished by flushing fresh water (distilled or rain water) through it's pot every day. This simulates the cool water that is constantly running over their roots in their natural habitat. Cobra Lilies must never be allowed to completely dry out. Do not fertilize your plant! Cobra Lilies have a large, extensive root system with branching runners that will produce new plants at their ends. 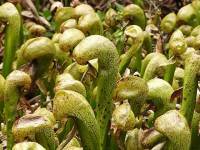 This, in addition to the need to have fresh water flushed through the root system, makes the Darlingtonia unsuited for growing in a terrarium. They should be planted in a large pot. An eight inch plastic pot or planter is suitable for smaller specimens. Allowing the plant to become pot bound for a year or two before repotting will produce larger heads. As the plant matures it will probably produce a great number of side shoots and eventually form a large clump. It is not a good idea to separate the clumps because of the sensitivity of the root system. Once divided, the plant may go into shock and fail to grow for an extended period of time, and will be susceptible to disease and fungal attacks. Cobra Lilies are fairly hardy, and in nature can survive being buried in snow during the winter. This makes them an excellent addition to an outdoor bog garden in USDA hardiness zones 7-10.